During the 1990's there was an explosion of inserts throughout the collector card industry and Batman trading cards are no exception. Inserts are special subset cards which are inserted at particular rates into some packs. They are hard to find and usually more intricate and detailed. Their rarity and eye appeal means they usually command a considerably higher value than standard set cards. Some of my most favorite Batman cards are Batman Gold Cards. There are several notable sets of Batman Gold Cards somewhat readily available which will grow any nice Batman memorabilia collection nicely. 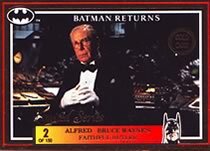 As with the 1966 Black, Red and Blue Bat sets, the Batman Returns cards of 1992 were licensed for local production worldwide. 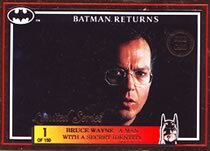 As luck would have it Dynamic Marketing in Australia was able to produce a set of Batman Gold cards which were not available through any other Batman Returns set. These cards make it into my top ten Batman cards as they are very cool for their time - and owning them takes me back to pulling them out of packs 20 years ago! The cards parallel the first 10 cards of the standard set where all main characters of the movie are introduced. However, unlike the standard cards, they feature high gloss gold foil and a gold stamp and 'Limited Series' script on the front of the card. They were quite difficult to pull (though you could also acquire them as a mail away using Gotham Dollars that were distributed in packs) and are somewhat rare in mint condition. You can, however, find them available on eBay fairly often. Here I have scans of the whole set for your viewing pleasure - you can also check out Batman Returns Gold Cards for sale now if you'd like to add these awesome cards to your collection! 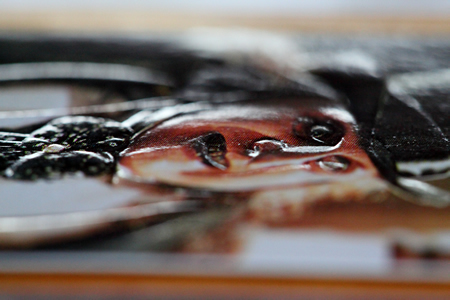 If you think the Dynamic Marketing cards above are cool wait until you see the embossed gold cards in person! 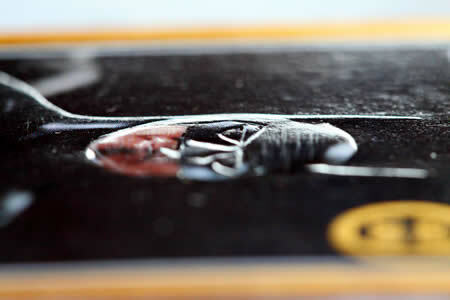 In addition to the already cool Batman Returns Gold Cards set Dynamic Marketing also released an embossed version. The embossed gold cards are the same as the standard gold cards in every way except that the character in the card is embossed (the front of the card pushes out in a 3D style). This is hard to show in a photo and is something you need to see in person but I've done my best below. Rumour has it that these cards were only available as mail away and many people are not convinced they necessarily exist! I can confirm that they certainly do as I am lucky enough to own both the standard gold card set and the embossed gold card set. Check out the close ups below to see the embossed effect - you might be lucky and find some Batman Return Embossed Gold cards for sale on eBay also! In 1995 Fleer produced a set of Batman Forever trading cards to coincide with the release of the Batman Forever film. As part of this set an insert sub set of Metal Gold cards were produced and randomly inserted into packs. 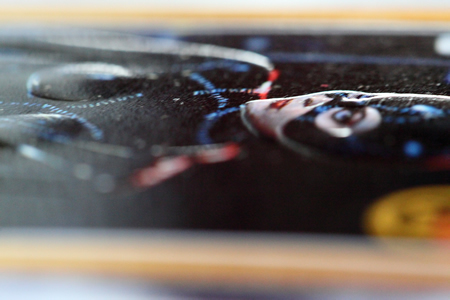 These dark Batman cards feature gold metallic surfaces along with the main characters from the film. Below I have scans of the Batman and Two-Face gold metal cards. They are readily available for sale online - check out eBay for Batman Forever Gold Metal cards for sale now. In 1996 DC Comics and Skybox released the Batman Holo series celebrating the comic book Batman. The basic set were all awesome holograms and each pack included one gold foil parallel version of the hologram cards. Additionally there was a four card gold HoloAction insert set inserted at a rate of one in 12 packs. These cards stand right out in any great Batman cards collection - they have real eye appeal with both a hologram effect as well as the gold foil shine. They are readily available for sale online and do not command huge values - check out eBay for Holo Series Gold cards for sale now. Below I have the Catwoman gold parallel card on the left along with the Joker HoloAction gold card (#H1) on the right. Batman gold cards are some of my favorite cards and will stand right out in your collection. I highly recommend them for all Batman memorabilia fans. I also have a page where you can quickly see all Batman Gold Cards for sale on eBay in one easy spot.